• Congratulations to the Fountain Valley High School String Orchestra on being named recipient of the 2018 Hans Schmelzer Music Award! The award was made in recognition of efforts at the school to provide students the opportunity to study the music of Central and Eastern Europe. The award includes a $1,000 grant to be used by the school for its music program. The Award Committee cited the orchestra’s performances of Divertimento Es-Dur für vier Streichinstrumente by Joseph Haydn and also Deception I (Music from the DaVinci Code for Percussion) by Hans Zimmer as excellent examples of the music of the German cultural areas of Central and Eastern Europe that has helped shape modern music development. In a letter to Mr. Al Nelson, Associate Director of Fountain Valley High School Instrumental Music, the committee stated, “We know that by studying and performing such music, your students will have a greater appreciation for the origins all genres of modern music and will have a broader awareness of the rich spectrum of music from around the world.” Performance of the music was on June 1, 2018, at Fountain Valley High School. More about the award is available by clicking here. Download the press release. • The Hans Schmelzer Music Award will provide grants to local schools, college, or non-profit organization music programs, to promote the study of mid-European folk, classical, and popular music. The award was established to honor Mr. Hans Schmelzer, the founder of the German-American Brass Band of Southern California. Donations to help fund the award are being accepted and are tax deductible. Donation Forms are available on-line. Make sure to mark "Schmelzer Award" on your Donation Form in order to designate it specifically for the grant fund. If you represent an ensemble or would like to submit a nomination for the award, get all the information and forms you need by clicking here. 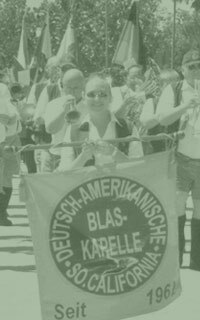 • Musicians interested in joining the AMF are invited to contact us for more information on joining our performance activity, the German-American Brass Band of Southern California.